I'm just going to put this out there for anyone that cares... I'm sick and tired of this weather! Yesterday it was a "balmy" 55 degrees F and pouring rain! What happened to spring? Grrr! So I thought about it long and hard and decided that maybe, just maybe, if I wear bright spring/summer colors whoever controls the weather will wake up and switch the channel!!! I do like this color because I happen to like most dark colors, but I think it belongs in a different set. Also I'm calling this color "black" because the polishes and the packaging don't list any names/numbers. 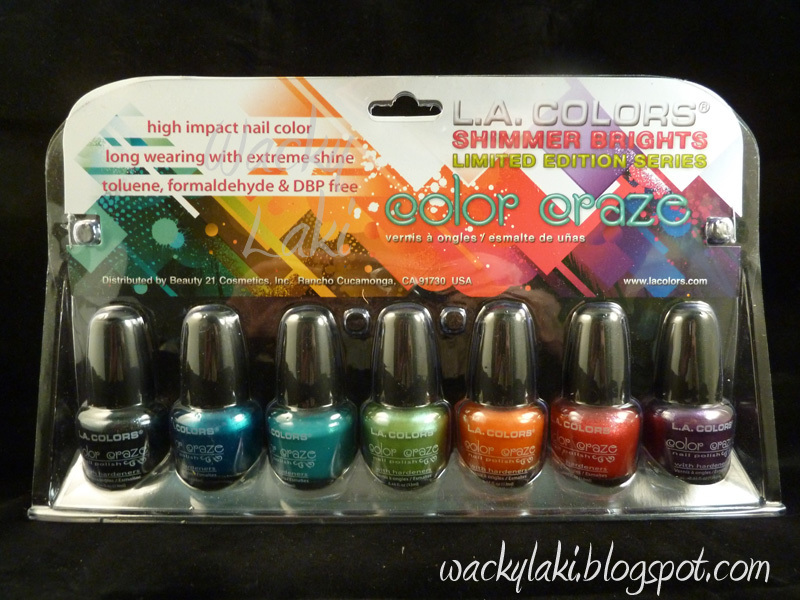 I tried searching online, but even the LA Colors website was not much help. I emailed the company so maybe I will get a response. Does anyone have a clue what these colors are named?? Toluene, Formaldehyde & DBP free! I got a set like that earlier this week but mine doesn't say Shimmer Brights. I guess I'll swatch mine this weekend to see how mine compares with yours. I got the same exact set at Ross a few weeks ago. Looking forward to the rest of your swatches! @Clair, it is really pretty! @ABOP, I found mine at Marshalls, but I have seen this set at Ross as you said!